“Don’t spoil the ship for a ha’porth of tar” (old proverb). Our CD player is technically disadvantaged: the CD tray goes out and in with an uncertain, clunky movement (see short video at top, with authentic French commentary). I seem to have a useful talent for unbolting things, working out how they function and sometimes repairing them. After unplugging it (important safety tip!) 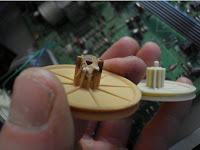 I took the cover off to reveal, amongst all manner of other electronic components, a silly plastic wheel missing some teeth. A few months ago, we were invited to dinner by Miranda and Grahame. Grahame is a designer and inventor. I was complaining to him how it is that tool manufacturers supply a sturdy plastic case, which is rendered less than useful as it can only fit the original tool and only then if it’s been packed by some expert, nimble-fingered far-eastern factory worker. As soon as the cable has been unravelled and a couple of extra blades bought, the case is a right old struggle to close; surely a tweak of the design would be easy. And then he revealed to us that, in his experience as a designer working for them, manufacturers don’t give a *(insert “monkey’s cuss”; “toss”; or, like Rhett Butler in Gone with the Wind, “damn”, as is your want) for the customer. I was shocked, honestly. Another manufacturers' trick is to design in obsolescence—so we are thus persuaded to purchase another thing—or, even worse, to design the thing to fail. Now this needs careful calculation, as if it fails too soon, we’ll be put off that brand but, if it doesn’t fail at all, we won’t need to buy another. My Marantz CD player is 15 years old, seemingly a long time, but it was destined for landfill if it got any worse, all for the want of a tiny plastic wheel. The specialist HiFi shop that sold it to me initially offered some hope that they could supply a replacement part, then dashed those same hopes a week later when they told me Marantz had stopped making them. I was now on a mission and just as I was about to ask The Oracle (Google) when another Internet solution popped into my mind: eBay. It took me a while playing around with search terms but I eventually found Ducksy Tse in Hong Kong who could sell me one. It arrived this week, with clear instructions, took five minutes to replace and it works perfectly. To learn more about the Story of [all the]Stuff we keep on accumulating, have a look at this great 20 minute video by Annie Leonard. And the saying at the top has nothing to do with ships but is rather “a dialect version of ‘sheep’ and refers to the smearing of tar on sheep against various infections, a practice common in Shakespeare's day.” Brewer’s Dictionary of Phrase and Fable (15th ed. p.1018) which is apposite as I’m currently treating one of our sheep with an antibiotic cream for a case of conjunctivitis.